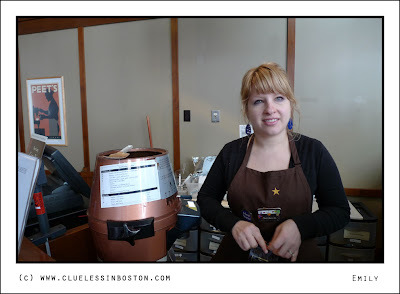 I met Emily in Peet's Coffee on High Street as she was grinding some coffee for me. She has worked at Peets for seven months but is leaving soon to work in a dentist's office, for which she jokes she has no experience. Don't worry, she won't be working with patients because her background is in Education. She would love to get a teaching job but none are available right now. Emily is a baseball fan of her hometown minor league team the Rochester Red Wings; who by the way play in the same league as my favorite minor league team, the Pawtucket Red Sox. She also told me both of her parents are professional photographers. Her father is a Leica afficiando so she was especially interested in my DLux-4. Note to Emily: if you want to see the other photo with the, as you termed it, "the Leica expression" on your face drop me a line. And thank you for letting me take your picture. Good luck in your career. For more information on the 100 Strangers Project visit the 100Strangers.com Project on Flickr. Up close & personal - excellent people profile, CiB. I love reading about the people in the photo and your way of having us meet your 100 strangers. Amazing there are no teaching jobs available. Some countries are crying out for teachers. Love your portrait and do hope Emily finds the right job soon. Nice 'stranger', funny coffee story. Your encounters become more and more interesting, because you give a portrait not only with picture but also with words; And You seem to meet the people more and more easily; I followed the link about the 100 strangers, it's really something fascinating. Now I'm impatient to see the nexts.. It's great you featured her! She seems very nice. Emily, if you read this, I hope you find a job in teaching. Good luck! Really great portrait in image and word, Clueless. Well done, you. What a lovely portrait! Teachers are being laid off here. It's a shame. I'm with Emily on this issue. Far less pretentiousness found at Peets ... not to mention the pervasive aroma found in their stores. Years ago, when Starbucks was a small business, you could find a similar atmosphere in their store at Pike Place Market. Not so today, though, as it has become every bit the iconic Mecca as the Eiffel Tower or the pyramids. Long lines snake out the door, spilling onto the sidewalk, on busy summer days; a must do and see for bus loads of tourists. Needless to say I never enter their original store for fear of being trampled. Fascinating, you did an in-depth interview with her! 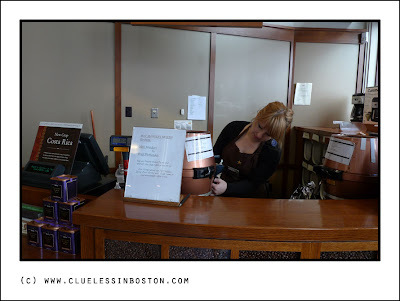 Does Peets serve Brazilian coffee too? Nice to meet you Emily! Thanks for saying 'Cheese' .. I mean 'Coffee' to Clueless' nifty camera! You have a gorgeous smile! Again a great portrait and a very thoughtful bio. A shame she can't find a job in her field. Nice portrait. I will her well. Another good portrait and with a matching story. I'm happy to say that we don't yet have Starbucks in Sweden! Bravo for joining the 100 Strangers. And good luck to Emily in her future new job. I'd love to see the other photo of my "Leica expression." I really enjoy your photos in general (not just the ones of me).